Adventures in LalaLand: Happy Canada Day! Happy Canada Day! 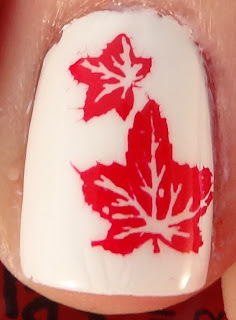 Since one of my besties is Canadian, I decided to make a Canada Day design. I had to make sure I included the iconic maple leaf, but everything else was just a red and white party. I used Confetti The Red Capet, Konad white, and Spoiled Shuffle the Deck.